Up to now, XDPXv16 has not been telling me how wonderful Xara Cloud is. The blurb is misleading as there are a great number of things that are possible in XDPX that are not implemented (yet) in Xara Cloud; I could mention layers as one essential example. I applaud the development team that has delivered an on-line product that is platform agnostic. I would further applaud Xara reporting on how close Xara Cloud's alignment to full compatibility is progressing against their Desktop applications. A simple roadmap and percentage of features realised would be all the marketing hype that is needed. Rob, I cannot "take my documents everywhere" if I am unable to "edit my files" and "collaborate with anyone, anywhere" and cannot handle transitions in "presentations". Yes, Xara Cloud implies Internet connectivity and collaboration implies people with Internet access and email accounts. It all kind of hides the truth around my "documents" and my "files" if they have layers or presentation steps. It doesn't mention Windows. Surely having a Desktop application menu item, Window > Xara Cloud is enough? Come on Acorn there's no need to be difficult here. 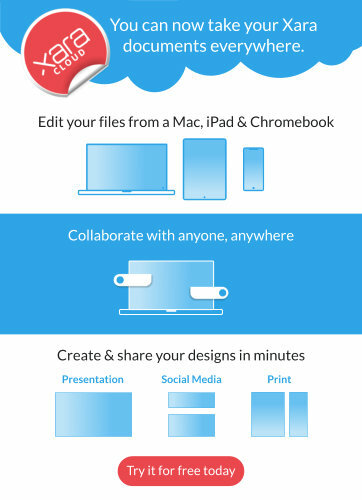 You know you can upload your files to a cloud drive (take them anywhere), open them up and change text for example (edit them), click the share editing button and share with someone (collaborate), and transition handling in presentations is on the list to be implemented (which isn't needed to have a presentation). There's nothing in the noticeboard that isn't true. There may be limitations or some things you can do so much but it's still possible. It's not misleading in any way. How so? Marketing departments do not advertise what their products can't do, and everything in the noticeboard is possible. Rob, sorry I didn't intend this to be a major tiff; I was trying to point out that drumming Xara Cloud into Xara Desktop application users while there are functional gaps is nothing more than irritating. limitations are web browser limitations. user friendly programming language at its core.